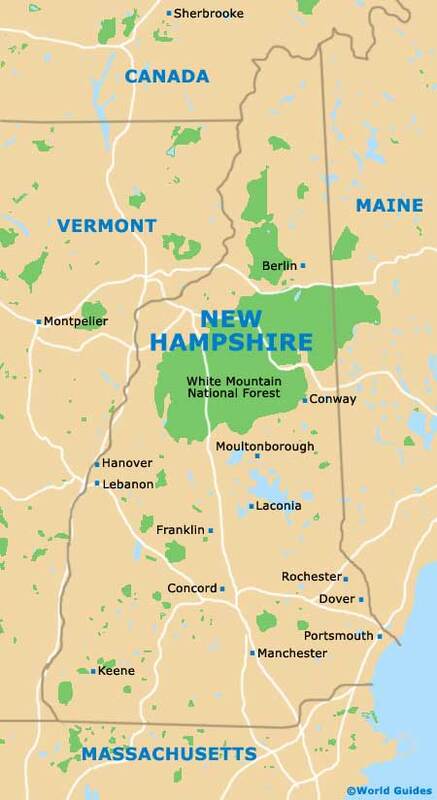 The state of New Hampshire is located on the far northeastern side of North America and is where you will find the city of Concord. Although this is actually the third-largest city in New Hampshire, after both Manchester (population of 110,000) and Nashua (population of 90,000), Concord is the state capital. The city has a population in the region of 45,000 and also serves as the county seat for Merrimack County. The Merrimack River runs along the eastern side of the city and is where you will find the NHTI Concord Island Reserve. Also on this side of the city is the busy Styles Bridges Highway (Interstate I-93), which heads in a north to south direction and intersects with the easterly Interstate I-393 (King Street). Downtown Concord is not very big or difficult to find, and if you have a pocket map with you, locating the principal sights is relatively straightforward. Particularly central are the New Hampshire Historical Society, the State House and the John Stark Statue. The Capitol Shopping Center bounds the eastern side of downtown Concord, while White Park lies a little to the west. Slightly further out of the city center is Horseshoe Pond (north), the Blossom Hill Cemetery (northwest), the Walker State Forest (west), and both the Memorial Field and Rollins Park (south). If you follow the I-93 northwards you will eventually cross the state border into Vermont. Boston, Massachusetts, is roughly 90 minutes to the south and reached via the I-93. If you head along the I-393 in an easterly direction, the coastal city of Portsmouth can be reached in just over an hour.